Barcelona: Atletico Madrid's turnaround under new coach Diego Simeone was highlighted by a first away victory in the Spanish league with a 4-0 rout of Real Sociedad thanks to Radamel Falcao's hat trick on Saturday. Atletico, unbeaten in three games under Simeone, caught a lackluster Sociedad flatfooted in the opening moments of both halves to go up 2-0 as rain fell steadily on Anoeta Stadium. Falcao stroked home a spot kick to give the visitors the lead just three minutes in following Vadim Demidov's booking for a handball inside the area, and strike partner Adrian Lopez volleyed in his own rebound after Sociedad goalkeeper Claudio Bravo blocked his header in the 47th. Falcao then caught Bravo off his line with an exquisite chip shot from outside the area in the 83rd, and the former Porto star sealed Sociedad's first loss in eight league fixtures with a goal in stoppage time by slicing in a pass from substitute Koke Resurreccion. 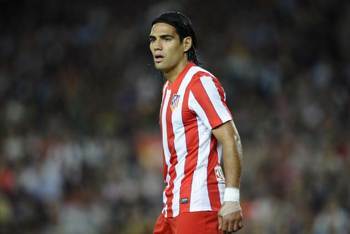 "(Falcao) is very good at shaking his marker," Simeone said. "He adapts to any situation." The Colombia striker, who leads Atletico with 14 goals in league play this season, also scored twice in last week's 3-0 win over Villarreal. Simeone, who as a midfielder helped Atletico win their last league title in 1996, thanked all of his players for their effort, saying they "put the team first." Under former coach Gregorio Manzano, Atletico had a record of one draw and six losses away from home in league play to start the season. Atletico have collected seven of nine possible points since Simeone's arrival and sit just four points out of fourth place, the last spot that earns Champions League qualification. "There is no special explanation needed to explain what happened," Sociedad coach Philippe Montanier said. Elsewhere, Espanyol overcame a depleted front line to defeat Granada 3-0 at home, while 10-man Sevilla drew 1-1 at Real Betis in the first Seville derby in nearly three years. With injured strikers Sergio Garcia and Alvaro Vazquez unavailable, Mauricio Pochettino turned to his midfield to produce goals. Raul Baena put Espanyol in front with a header in the 26th and playmaker Joan Verdu added a second from the penalty spot after Vladimir Weiss was fouled by Allan Nyom just before halftime. Substitute Rui Fonte capped the victory with a goal in the 80th by tapping in a free kick by Ndri Romaric that had come off the crossbar. Espanyol's fifth game without a loss lifted them into fifth place in the standings. Before the match Espanyol unveiled a statue of Dani Jarque, the former captain who died of a heart attack in 2009, at Cornella-El Prat Stadium. "The match may have looked like a walk in the park but it was far from it," Pochettino said. "Today was special for us to pay tribute to our eternal captain." At Benito Villamarin Stadium, Benat Etxebarria scored Betis' 26th-minute opener when he curled a free kick over the defensive wall and away from a diving Javi Varas into the left corner of the net. Sevilla scored a deserved equalizer through Alvaro Negredo's header in the 41st, but Marcelino Garcia's team could not avoid extending their winless run to five consecutive games after Federico Fazio was sent off with his second yellow card in the 69th. Also, Getafe dealt Racing Santander their first loss in six weeks since the exit of coach Hector Cuper with a 2-1 comeback win secured by Nicolas "Miku" Fedor in the 83rd minute. League leader Real Madrid host the in-form Athletic Bilbao on Sunday before second-place Barcelona visit Malaga. Barcelona then host Madrid on Wednesday in the second leg of their Copa del Rey quarterfinal after winning the away leg 2-1. Also on Sunday, it's: Osasuna vs. Valencia; Rayo Vallecano vs. Mallorca; and Levante vs. Zaragoza. Sporting Gijon are at Villarreal on Monday in a matchup of teams looking to escape the relegation zone.